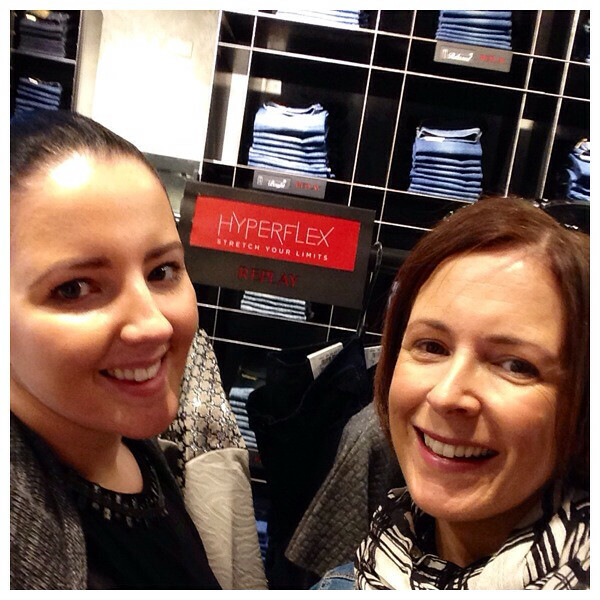 When I put on these Replay Hyperflex Skinny Jeans at the launch day in Victoria Square a couple of weeks back, I was blown away. Just the right rise, with a real 'spanx' effect but a thick enough denim so that they don't show every lump and bump. If all that wasn't enough, the colour is perfect - dark but not a flat navy rinse that can make jeans look too much like trousers. They're an investment pair - most quality jeans are. But the total value of the 8 pairs I gave to charity or consigned, thanks to finally finding these perfect skinnies, added up to much more than the Replay ones cost. A lesson that has informed my current clear-out. But here was the real draw - they promise to uplift your behind.....look away now & scroll if you don't want to see the evidence but I'm ok with my rear looking this good at 41! 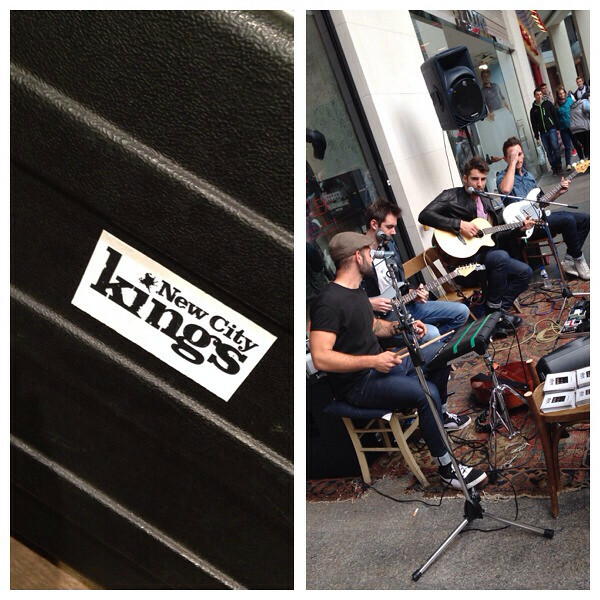 To coincide with the launch, Reply Jeans have teamed up with UK band The New City Kings, sponsoring their UK tour and bringing them along to the Hyperflex launches. 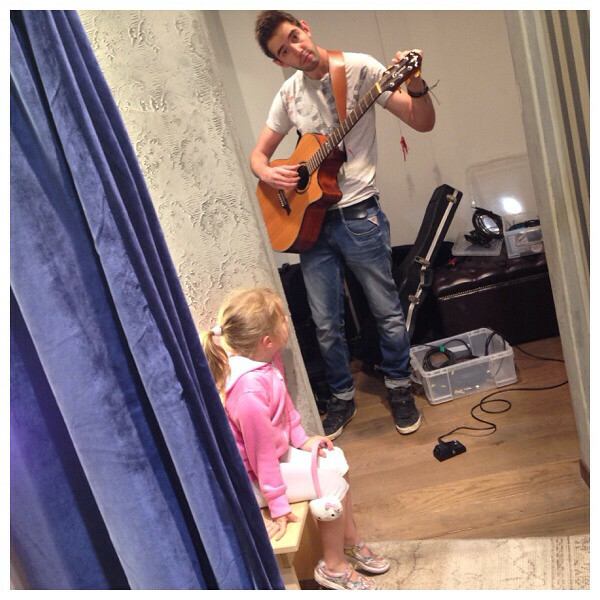 As I arrived at the store super early, I got to see the band prepping in the store room and one of my girls was particularly fascinated with the guitar tuning process. She sat in that spot for over half an hour watching closely! Since I was last in the Replay store, they've launched a range called One Off - a gorgeous higher-end limited edition range of clothing that was reminiscent of All Saints. 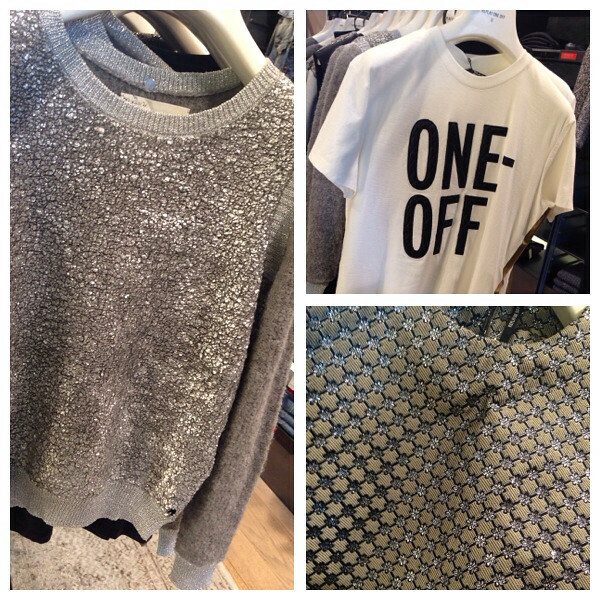 Some gorgeous embellished pieces with beautiful details...wish I'd had more time to try on. Then it was time to head home in an entirely different outfit to the one I arrived in as I couldn't resist this Replay T-shirt to wear with my new jeans. 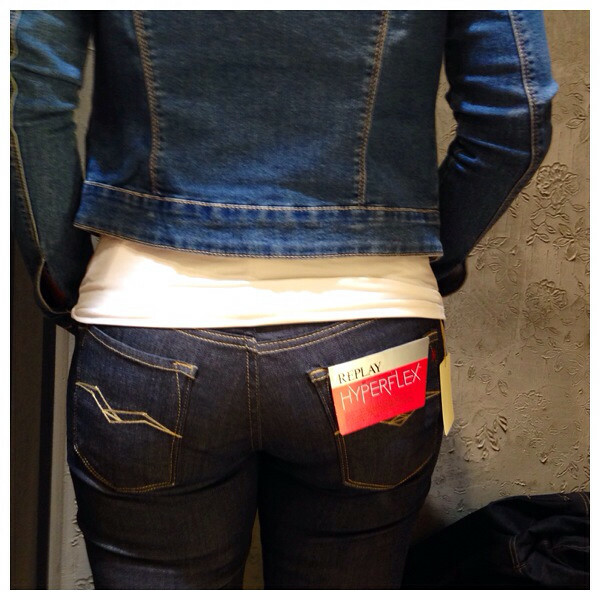 I decided to hold off blogging about these jeans until I'd put the comfort & shape-holding claims to the test. I've worn these jeans for 10 days over the past 2 weeks and I have to say, I'm blown away by how stretchy and flexible they are - akin to a jegging style trouser. But most impressively, they have held their shape. Do you know when your skinnies have just been through the wash and you wear them for the first time straight out of the drier? It's like they've pinged back into shape again and they feel lovely and supportive. Well, that's exactly how it feels putting on these Replay jeans every single day....without any laundering. That has to be a win/win. 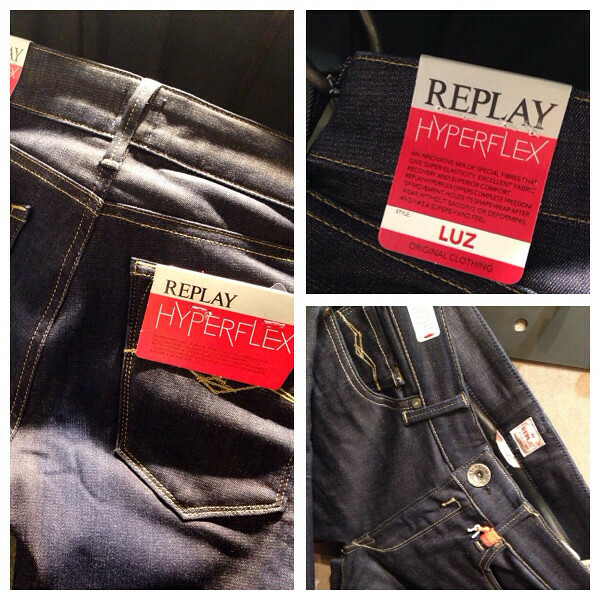 Thanks to the team at Replay for inviting me along - Replay Hyperflex jeans are available online here and in Replay stores. UPDATE - forgot to talk about sizing! So I fitted into the 28 in these. I'd say the sizing is similar to Gap. 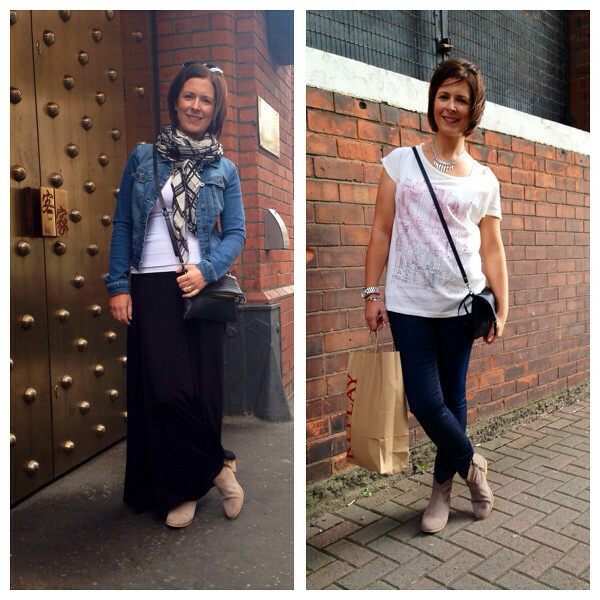 My other Replay jeans are a 30 or 31 I think! The leg is 32 but seems long so I've taken mine up a couple of inches. There is a size 30 leg available but they weren't there on the day I was in. Your backside looks awesome and you have every reason to be proud! I daren't look at mine. And yes, I think you may have a point about paying out for denim - I have a couple of pairs of more expensive denim and I could see and feel the difference with them to some of the cheaper pairs I have but I love variety and jeans are those awful things where you just can't stop buying them and are always in search of the next "better" pair. I'm glad you found your pair though. Now can you come and clear out my wardrobe please? Great jeans. Good to know. I bought some straight leg ones from The White Stuff a few weeks ago. Seemed fine but then kept falling down and I was forever hitching them. Got some from Levi now. Think you're right, you have to invest sometimes. I've bought some black skinniest from Banana Republic but not worn them yet. Need to road test them! Love the jeans on you Avril, I must give these a go as they sound amazing in terms of their foot & hold. Dare I ask how many scarves are left in your collection if you've gort rid of. 23?!!! Wow. 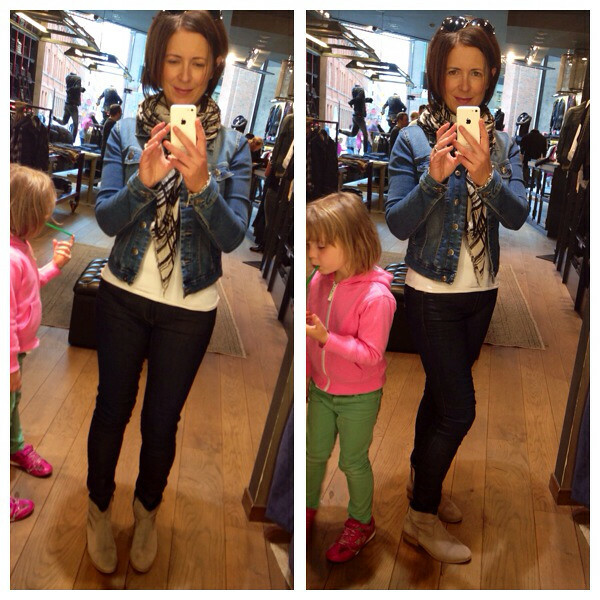 They look amazing, I think I NEED some once you mentioned bumps/thin denim avoidance. Can I be cheeky and ask what size you wear? Are they true to size? Not cheeky at all & I must add a footnote about sizing! I was able to size down to a 28 so sizing is similar to gap in these ones - my other replays are a 31 I think!